Call 860-546-6998 to schedule an appointment. Providing mobile veterinary services and mobile emergency services in eastern Connecticut and Rhode Island. Veterinary care to horses, cattle, goats, sheep, pigs and other farm animals or even the occasional bison or alpaca! Country Critters Veterinary Services, Inc.
Dr. Dina J. Scotto, Cranston, RI. A 100% mobile, primarily large animal (dairy/beef cows, sheep, goats, pigs, and chickens), mobile veterinary service in Rhode Island. Telephone: (401)464-2876, Email countrycrittersvet@gmail.com. A mobile primarily large animal veterinarian serving eastern CT and western RI, focusing on large animal medicine for almost all barnyard species, including cows, yaks, horses, donkeys, sheep, goats, llamas, alpacas, and pigs. Also provides routine care for your dogs and cats, as well as at-home euthanasia services for your pets. Dr. Thibeault has had experience with farm and livestock care since 1994. 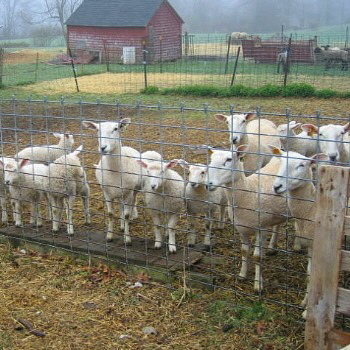 New Canaan, CT. Offering veterinary services for livestock. Please call 203-972-7387 for more information and availability. Providing large animal veterinary service for Eastern Connecticut and all of Rhode Island. 24/7 Emergency Response: In the event of an emergency - please call immediately. If I do not answer the phone, please leave a message. If you do not receive a response in 15 minutes, please call again. Please do no email emergencies. Wakefield, RI. In conjunction with Seaside Veterinary Services, of Westerly, RI, now providing mobile livestock services to RI and Southeastern CT. The practices can provide on farm services for cattle, small ruminants, camelids, poultry, swine, exotics, equine and companion animals. Services are by appointment with limited emergency services based on availability. Interested farms can contact Dr. Hannafin directly at NSVS, P.O. Box 5208, Wakefield, RI 02897, (401) 783-7789 or via Seaside Veterinary Services, in Westerly at 401-533-1322. Please visit the website at www.seasidevetservices.com. Riverside, RI. Call 401-433-2070 (clinic) or 603-667-0058 (cell). Please visit the website at www.riversideanimalhospitalri.com. 149 New Sweden Road, Woodstock, CT 06281. Tufts Veterinary Field Service is a mixed, large animal veterinary practice with a joint focus on clinical service (preventing and treating illness) and teaching aspiring veterinary students from Cummings School of Veterinary Medicine. Based in Woodstock, CT, our faculty and staff care for nearly 55,000 animals annually: including approximately 49,000 bovines on over 70 dairy farms, 2,700 equines, and 2,500 small ruminants. Teaching and service are core to our mission. Our faculty promotes the health and well-being of farm animals through prevention and treatment of disease, enhances the viability and sustainability of livestock-based farms and develops veterinary students' knowledge of large animal medicine. A veterinarian from Tufts Veterinary Field Service is on call 24 hours a day, 7 days a week, including holidays, to provide emergency services for your equine, bovine or small ruminant 365 days a year. If you are unsure whether or not your animal's problem constitutes an emergency requiring immediate attention, please contact the clinic at 860-974-2780 so that our veterinarians can help determine the best course of action to pursue.